It may sound too good to be true, but it's actually easy to sync an Android phone with your Mac just as seamlessly as an iPhone could. Even better, the majority of syncing is done in the background for you, constantly, through Google. The key to headache-free syncing between Mac and Android is to use Google's cloud services as middle-men between the two. Your phone's already designed around using Google for its mail, contact and calendar data, so we're just going to show you how to sync those down to your Mac, which takes little to no effort. Once you've got it all set up, the only reason you'll ever have for plugging your Android phone into your Mac will be to sync music (and if you really want to, you can sync that over Wi-Fi too). If you don't use an email app on your Mac, but instead just use a browser to access a Gmail account, then you don't need to worry about Mail at all. If you do use the app, you'll be happy to know that syncing it with a Gmail account is so simple that it's almost automated. 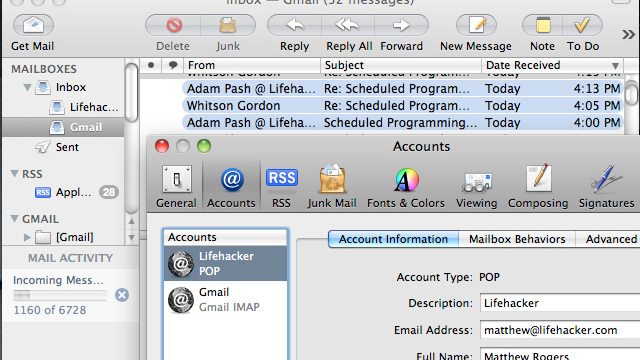 Simply open Mail's preferences, click on Accounts in the top bar, then click the "+" symbol at the bottom-left of the window. After that, it's as simple as entering your name, email address and login information. Mail automatically knows what settings to choose for Gmail. Open the Address Book, then open its preferences and click on Accounts in the top bar of the window. You should see an account called "On My Mac Local", which should already be selected. To the right of that is a check-box labelled "Synchronize with Google". Just check the box! Afterwards, you should see a small sync icon in your Mac's menu bar. 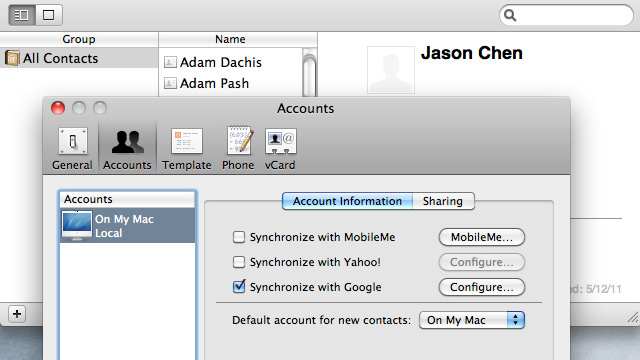 Normally, that sync indicator would be used by MobileMe, but it'll also work for other accounts. If you click on it, a menu will appear and you'll have the option to "sync now". Click that, and Address Book will begin to fill up with entries from your Google Contacts within a few seconds. Simple as that, your contacts are synced. In iCal, open preferences, then click on Accounts in the top bar. Click the "+" symbol at the bottom-left of the window. Leave Account Type set to "Automatic", then enter your Gmail login information. After you click Create, iCal will sync your Google Calendar automatically. If you use reminders or alerts of any sort in Google Calendar, you'll also want to click the Advanced tab in iCal's preferences, and check the box marked "Turn off all alarms". Otherwise, you'll be receiving double reminders. DoubleTwist is called "iTunes for Android" for a reason. Not only does it look like a miniature iTunes, but it performs most of the same functions, only for your Android phone instead of an iPhone. With DoubleTwist, you can sync music to and from your phone, whether it's song by song or a whole playlist. It's fast, simple and free (which we like). There's also a DoubleTwist music player app available for Android, but it's not required to play anything that you sync using the desktop app. The DoubleTwist desktop app for Mac doesn't only handle music, you can sync photos and videos just as easily with the built-in media browser. On the Mac side, you can either use Google's Picasa desktop software to sync Picasa albums, or you can use the iPhoto to Picasa uploader. 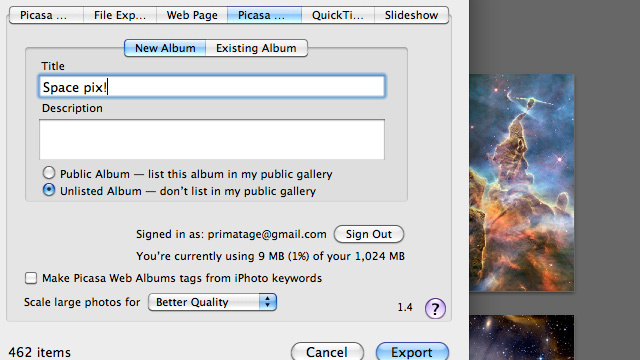 This iPhoto plug-in which will let you upload and manage Picasa albums by choosing File, then Export. If you've chosen to sync with Flickr, you can just hit the Flickr button in the bottom right hand corner of iPhoto's window to send any album to your Flickr account — it's already built-in. Apple has actually made it very easy to sync your data with Google, so the setup should take you very little time, and by the end, you'll have all your favourite Mac apps syncing data right to your phone. From here on out, your mail, address book, calendars and music libraries should look the same on both devices, without you having to lift a finger. Got your own tricks for keeping your Mac and Android phone in sync? Let us know in the comments. For mac, i've found double twist to be slow and a little buggy for syncing music (and also for playing music on the mac). Instead i use iSyncr and iSyncr wifi for all my syncing needs. This allows you to continue using itunes as per normal. By far the best syncing app i've found. I'm having issues with the syncing of calendars from my macbook pro to my new Samsung Galaxy s2. I have a number of different calendars on my mac which are also syncing to my iMac at work. 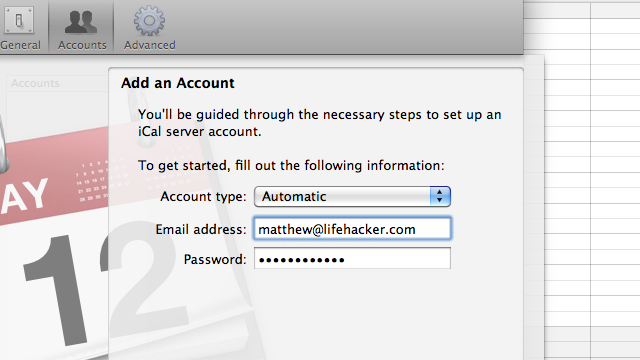 My mac book pro is running lion and when I go to add an account as shown above, I don't have an option to pick automatic. Did you find an answer to this? I'm having the same problem with galaxy s3. The contacts worked fine, but not the calendar. I have an HTC Vivid and a Macbook Pro w/ Retina Display. I've had no problem with syncing my calendar and contacts via my Gmail account, however, I want to be able to sync my "reminders" as well. On the Macbook the program is called Reminders and on the phone it is Tasks. I went into the accounts settings for Tasks but it doesn't let me add a Gmail account ( the entire option of Managing Accounts is inaccessible). I downloaded gTasks from the Play Store, but can't figure it out myself. Any advice?